Over the years I have met many people whose spouses betrayed them in adultery. 99.9% of them are divorced. Most of them explained to me that they divorced their spouse when they discovered the betrayal because they felt they could never trust him or her again. In this group of divorced people I have found one thing to be universally true ~ no matter how long it has been since they divorced, they are all still hurting from the betrayal. When we discover that the person we love most in the whole world has rejected us for someone else, we have several options. Decide that we don’t have to take this kind of treatment and end the relationship. Stay in the relationship but make him or her pay dearly. Stay emotionally detached so we can’t get hurt again. Find someone and have our own affair. Forgive and get our heart healed. Of all the options, those who chose the last one seem to be the only people I meet who are not still carrying hurts and anger. Forgiveness and healing are truly the only road to a healthy life. When people ask me how I can talk about all that happened with our marriage and not still be hurting, I share with them that when Jesus heals, He heals completely. It is not anything extraordinary that I did or anything that is special about me. I simply submitted my broken heart to Jesus and walked closely with Him as He taught me what true forgiveness is. I was devastated, hurt beyond words, angry, and periodically in despair. There was no superhuman strength within me personally. It was all His strength and His healing. I truly believe there is no shortcut past forgiveness. You cannot decide to just get on with your life and hope for health. Forgiveness is the key that unlocks all the other doors. Personal healing comes when you release the hold that betrayal has on you. And I believe it is not just a one-time deal. I had to forgive over and over again and repent over and over again when my heart began to harden once more. When we make a decision to forgive, Jesus walks through the steps of what true forgiveness means. Feelings or emotions seem to be the last to conform to true forgiveness. Many times people are waiting to “feel” like forgiving. Forget it! That is the last thing you are going to feel when you are in a thousand emotional pieces. Choosing to forgive when nothing within you feels like it is what starts you on the journey. I have heard it said that forgiveness releases all claim for the wrong and I believe that is part of it, but the end result of forgiveness, I truly believe, is compassion and blessing. As your own heart is healed by the Lord, He can then begin pouring His compassion into that healthy vessel. The compassion of the Lord is what brought Him to tears over Jerusalem. His compassion for the lost nailed Him to the cross. When His compassion for your spouse begins to flow through your heart, you will see with new eyes of understanding. Your intercession will come out of a desire to see your spouse set free and walking with the Lord. You will desire to bless, not out of a need to receive in return, but out of a heart that overflows with God’s love and compassion. Marilyn, I have realised I cannot stand without forgiving my spouse, but it is not only about standing for my marriage, but to do what God would want me to do. I cannot read the word and not forgive, I cannot want to live a life for God and not forgive, and I cannot expect to be forgiven by the one who has shed is blood for me and not forgive. I forgive my husband every day, I pray for him every day and I see the changes in me daily. Thanks be to GOD!!! Thanks to you always for your encouragement! Thanks Marilyn for this timely post on forgiveness. This is a topic that I must think about about, pray about and actively pursue daily. Sometimes it's hard to hear Gods voice. The path is not always clear. I, too, believe that forgiveness must come first before I will hear Him directing my next step on the roadmap He has planned for my life. It's all easier said than done, though. I appreciate your encouraging words. God bless and Merry Christmas! Thank you for these words of truth. I can relate to so much of what you said. By the grace of God, I am walking that path of forgiveness and healing. As tough and agonizing as it has been at times, the freedom God has brought into my life and the intimacy I share with Him has swallowed up the pain of betrayal and abandonment. I know there are more rough days ahead as I allow God to continue His healing. But I have experienced that compassion you talk about towards my estranged husband, and know it's from the Lord and not me. Although we are still married, we're living separated and haven't been a husband and wife for 3 years. It seems impossible for this marriage to be restored and I'm okay with that. My prayer is that my husband will return to the Lord and let Him heal the damage that sin has caused in his own heart. In the meantime, I am thankful for all God is doing in me and in my children. Rebuilding trust is such an important part of healing. Jesus is the only one who can bring complete healing and return trust to your heart. 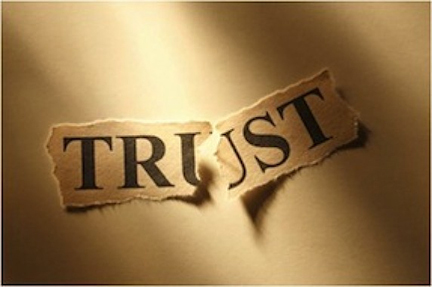 When we are deeply wounded, it is not a time to work at trusting people. It is a time to trust Him and as your heart is healed, trust for people will return. When Jesus ministers healing to us, though, it is not about the other person and what he has done. Jesus works within our own heart if we are willing to be totally honest with Him. The choice is yours. Surrender totally to Him or continue to hold the hurt within you. Agnes, I pray that you will have the courage to take the path to healing!